One of my favorite movie lines is in Blade Runner when Hannibal Chew tells Roy Batty that he designed his eyes. Until reality catches up with science fiction, eye design is still in the hands of designing prosthetic and attractive, but non-functional eyes. This intriguing video features David Carpenter of the Ocular prosthetics division of Moorfields Eye Hospital discussing how to make a prosthetic eye to replace one lost due to trauma or disease. Every year, David and his team craft 1,400 customized prosthetic eyes for patients, filling a fundamental cosmetic need. 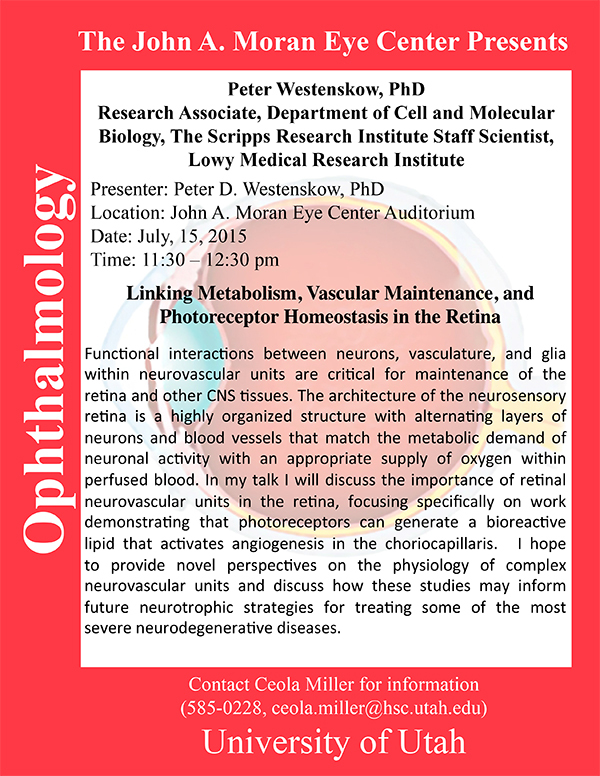 Peter Westenskow, Research Associate, Department of Cell and Molecular Biology, The Scripps Research Institute Staff Scientist, Lowy Medical Research Institute will be delivering a seminar on Linking Metabolism, Vascular Maintenance, and Photoreceptor Homeostasis in the Retina on Wednesday, July 2nd 15th at Noon in the the Moran Eye Center auditorium. Abstract: Functional interactions between neurons, vasculature, and glia within neurovascular units are critical for maintenance of the retina and other CNS tissues. The architecture of the neurosensory retina is a highly organized structure with alternating layers of neurons and blood vessels that match the metabolic demand of neuronal activity with an appropriate supply of oxygen within perfused blood. 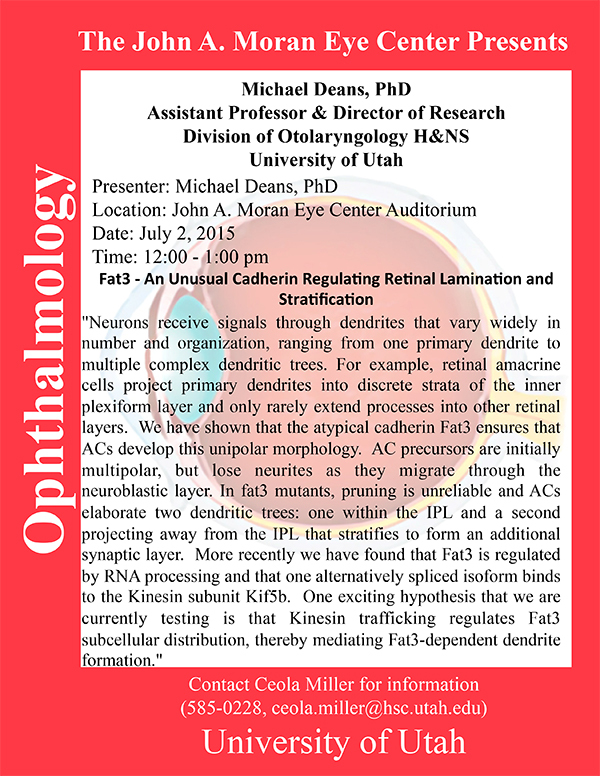 In my talk I will discuss the importance of retinal neurovascular units in the retina, focusing specifically on work demonstrating that photoreceptors can generate a bioreactive lipid that activates angiogenesis in the choriocapillaris. I hope to provide novel perspectives on the physiology of complex neurovascular units and discuss how these studies may inform future neurotrophic strategies for treating some of the most severe neurodegenerative diseases.